This latest update of the Jaguar removes some performance problems and adds a menu of sounds made for the modern player. Shallow-slotted tuners. Vibrato arm operation. "This Pawn Shopper stems from the long-established Jaguar, but the substantial modifications made by Fender have turned it into a very different animal"
As the name suggests, this Pawn Shopper stems from the long-established Jaguar, but the substantial modifications made by Fender have turned it into a very different animal. That said, the bolt-on maple neck stays pretty much unaltered, and is topped by the typical enlarged headstock, which carries vintage-style Kluson copy tuners - the same as those fitted to numerous modern Fenders and Squiers. The posts duly incorporate the usual centre holes, but the partner top slots are very shallow, which can make stringing a little tricky at times. The brand logo looks a little lonely because, like some other recent out-of-the-ordinary Fender/Squier instruments, the Jaguarillo lacks an appropriate accompanying model decal. This absence imparts an almost unfinished, prototype image, and also suggests short-term catalogue status. "The smoothly finished neck provides predictably easy playability, and one that's helped by the guitar's mainstream neck profile"
The truss-rod adjuster is headstock mounted in the usual modern manner, sited just behind a very nicely cut nut that leads onto a shallow-radius rosewood fingerboard. This employs the Jaguar's standard combination of 22 frets and shortened scale length (610mm/24 inches), which allows a more elastic action and ease of bending. The smoothly finished end result provides predictably easy playability, and one that's helped by the guitar's mainstream neck profile, although the gloss finish yields a more vintage impression. Naturally enough, the alder body is all-Jaguar, with the classic offset shape and smooth contours enhanced by a high-shine polyester paint job executed in Faded Sonic Blue. The latter contrasts a vintage-tint scratchplate that adopts the Jag's usual outline, but the similarities end there. Pickups comprise Strat-style single coils in neck and centre positions, while an Atomic humbucker is based at the bridge, with all three mounted in matching angled formation. The scratchplate also carries a lever-type five-way selector, located where the triple-switch panel is usually positioned on a Jaguar. In contrast, the latter's chromed control plate is present and correct, complete with master volume and tone pots, plus output jack. As on some other updated Jaguar variants, the Jaguarillo features Fender's Adjusto- Matic bridge, which blatantly apes Gibson's later-style Tune- O-Matic. Installing this type of twin-pillar design on a Fender usually requires some constructional amendments, and, here, the snug-fitting neck sits in a slightly sloping body pocket. The resulting additional tilt ensures that there are adequate height adjustments for the bridge, which is further aided by recessing this through the scratchplate. The vibrato tailpiece looks to be regulation Jaguar issue, but the long arm differs by being screw-in, rather than the familiar push-fit version. Presumably, the intention is to obviate the latter's sometimes sloppy fit, but unfortunately, on the review guitar the alternative is equally loose, except when fully screwed in, which then puts it too far round and beyond operational reach. "An absence of many usual attendant Jaguar rattles indicates that the Adjusto-Matic bridge is a change for the better"
The Jaguarillo rings quite well acoustically, while an absence of many usual attendant Jaguar rattles indicates that the Adjusto-Matic bridge is a change for the better. Fender describes the two Strat-style single coils as 'standard', but they pack plenty of power, and prove a good match for the zebra-bobbin Atomic humbucker at the bridge. The latter certainly lives up to its name, combining pretty brutal output with a thick-toned but edgy attack. This pickup is tailor-made for gain, and accordingly, doesn't sound too subtle under clean conditions. Better dirt-free delivery is obtained from the two single coils, either on their own or together, being typically clear, crisp and twangy. The neck- and-centre setting is hum- cancelling, while the middle- plus-bridge position offers a beefier variation on the classic funky Strat sound. Unsurprisingly, the Jaguarillo works well with added overdrive, supplying anything from grungy grunt to a searing snarl that's far removed from any standard Jag. The volume control comes in useful for cleaning-up duties here, while the tone pot rings the changes in an equally gradual manner. 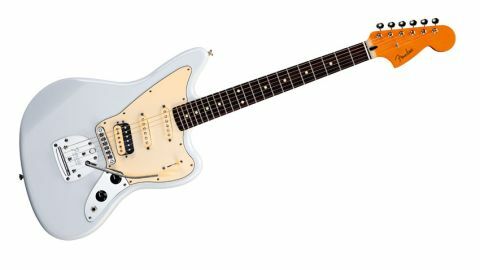 In conclusion, the Jaguarillo offers the styling and some key features of the Jaguar, but broadens its appeal by simplifying this oldie's circuitry, while adding a few Strat-style sounds and the upfront attack of a no-nonsense humbucker.